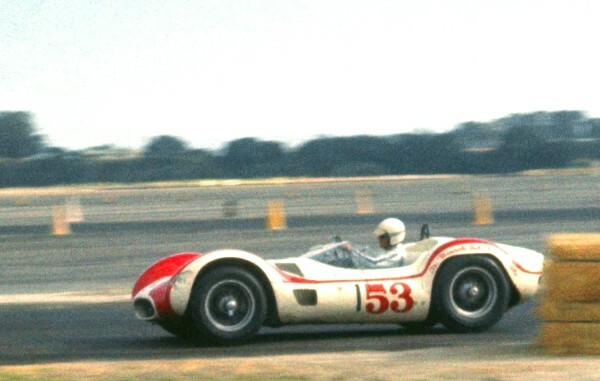 Krause won the Oct. 16, 1960 Riverside GP in Maserati Type 61 "Birdcage" #2469. Then the car was sold to Chuck Sargent. In 1962, he won many California races in another "Birdcage", the ex-Bob Drake #2452. In Pete Vanlaw's photo, Krause rounds Riverside's Turn 6 on his way to victory in the L.A. Times Grand Prix in 1960. To learn more about Krause and his experiences in the "Birdcage" Maseratis and other cars read Willem Oosthoek's excellent interview in "Il Tridente" magazine. Krause at Santa Barbara on May 26-27, 1962 in Birdcage #2452. This was the ex-Bob Drake, ex-Jim Connor car with many hard racing miles. Krause led the main event but the fragile Maserati failed, giving the win to Ken Miles in Otto Zipper's ex-John von Neumann Ferrari 625TRC/V12 "Hot rod". Krause and his crew found reliability and ran up a string of main event wins in 1962 before Krause embarked on the ill-starred "Elva-Maserati" (later the "Vinegaroon") project. Video! 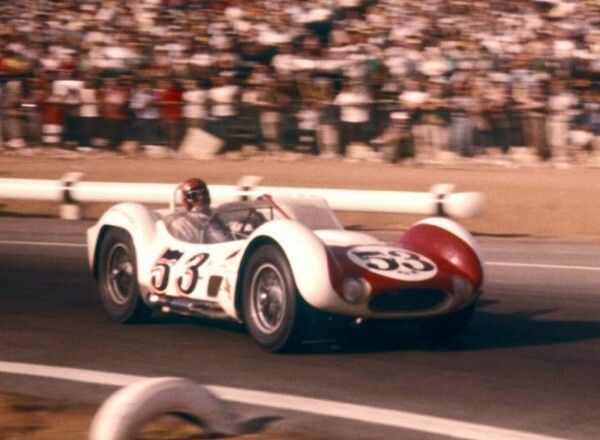 See Krause in action in Birdcage Maserati #2452 at Santa Barbara in May, 1962. He was the first driver to race a factory Cobra for Carroll Shelby, appearing in an enduro supporting the 1962 Riverside GP. This race is described in detail in Michael Antonick's book "California Screamin' ". Krause easily led the Corvette Stingrays, also making their debut, but DNF'd when a halfshaft broke. All photographs and text are the property of Tam McPartland, Bob Norton, and Pete Van Law and are protected under United States and international copyright laws. All rights are reserved and the images and/or text may not be digitized, reproduced, stored, manipulated, and/or incorporated into other works without the written permission of the photographers, Tam McPartland, Bob Norton, and Pete Van Law.